Home/Leadership/Leadership for the New Services Economy. Don’t get left behind. If you haven’t realized it yet, we are smack in the center of a spectacular tectonic transition that is rendering all previously accepted business models obsolete—the transition to a digital services economy. The new services economy is making services more relevant than products. Others might boldly proclaim the end of the product era and herald the rise of the new services economy. Services have become the new product. Per a recent post from the US secretary of commerce, the United States exported roughly $400 billion in digitally-deliverable services, accounting for more than half of U.S. services exports and about one-sixth of all U.S. goods and services exports. Global giants like IBM now treat their business as a services business. Companies like Google, Facebook, Airbnb and others are leaning on new services to grow their footprint and revenues globally. Make no mistake. Transitions test mettle. The hallmark of a great company is to see such transitions coming and retool itself to lead through them. Whether you’re a CEO with a burning desire to take your company that extra mile or a CIO looking to revitalize a Fortune 500 company, get ready to learn the secrets that transformed Cisco from a product company into one of the leading global services organizations of its time. 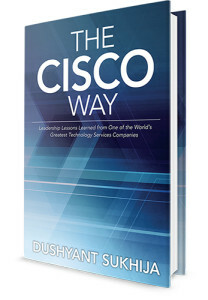 Catapult yourself into the next level of leadership with my groundbreaking new book, The Cisco Way: Leadership Lessons Learned from One of the World’s Greatest Technology Services Companies. After fourteen years at Cisco, all in senior services leadership roles, I have compiled a comprehensive guide that answers one of the most pressing questions facing today’s business leaders: how can I navigate the transformation to a services-led business to stay relevant in my market? Through clear, real-world examples and nine easy-to-read steps, which I call leadership lessons, you’ll learn the winning strategies and frameworks that have resulted in Cisco’s phenomenal success. More importantly, you’ll discover how to apply these concepts to your own businesses in order to achieve the results you crave. Take the first step toward unparalleled success with this comprehensive blueprint for corporations of every size and shape. Leadership for the New Services Economy.